Darling is a little Pregnant Chi, whose milk coming in. 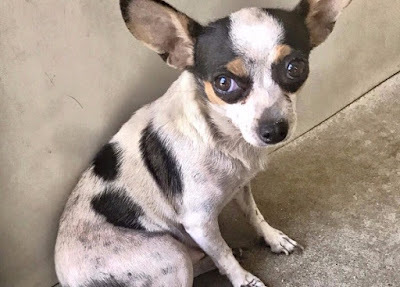 Darling needs out of shelter soon, her 18 Hours of Hope is quickly fading, killing starts soon and it is heartbreaking :( NOT RESERVED - Darling WILL BE KILL SHORTLY at San Bernardino City Animal Shelter. A volunteer writes: How does Darling's frail little body hold her big heart!? This guy might be a little painful to look at but the sight of her ribs is quickly overshadowed by her unbelievably wiggly tail and loving demeanor. she always wants to stay close and is super playful. she loves toys and treats and will eventually sit for them. she loves to hang out on laps and is reported to do well around children. she's looking for a home to fatten up in and a person to love! Another Volunteer writes: I spent some time with little Darling tonight and she is sooooo sweet!!! she's obviously a heartbreaker. Emaciated. Pressure sores. Craving any sort of attention. she's very housetrained, super cuddle, seemed to largely ignore the dog in the adjacent pen, and is obviously food motivated. she's a really good boy! !